Every March the Inn at Ellis River celebrates Maple Sugaring season with special maple recipes for our gourmet country breakfasts and afternoon refreshments. 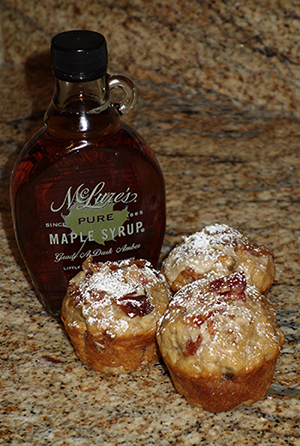 In 2014, we participated in the Inn-to-Inn March Maple Madness, and these muffins won the prize for best recipe ~ so what could be better than starting a chilly spring morning with maple and bacon? Preheat oven to 350 degrees F. Grease a 12 cup muffin pan with non-stick cooking spray. Mash three of the bananas and dice the fourth one, so that some small pieces of banana will be incorporated in the muffins. Combine baking powder, salt, and flour in a large bowl and form a well in the center of the mixture. In a separate bowl, combine egg, milk, oil, 1/3 cup maple syrup, and 3 teaspoons natural maple extract. Add mashed bananas to wet ingredients and pour wet mixture into well in dry ingredients. Stir until just combined (you may need to use slightly more or less milk, depending on ripeness of bananas), then fold in diced banana and 2/3 cup of diced bacon. Fill muffin cups 2/3 full, and sprinkle remaining bacon over the top of the muffins. Bake for approximately 20-25 minutes or until a toothpick inserted in the center comes out clean. While muffins cool, prepare maple glaze by combining the 3 tablespoons of maple syrup, confectioner’s sugar, cream or milk, and ½-1 teaspoon maple extract. Add more sugar or liquid if needed to achieve the consistency for drizzling over muffins. Drizzle glaze over muffins and sprinkle with additional bacon pieces if desired.Yield: Approximately 12 muffins. *Prepare bacon by placing on parchment-lined baking sheet, rubbing with about 1 ½ – 2 Tablespoons light brown sugar, and baking in a 400 degree F. oven until crisp. When cool, use scissors or knife to cut into small pieces.